Before Spring’18 release, it was not possible to attach a file from a Flow. For example, if you build a Flow that allows your sales rep to create a Contract you would also want them to attach a Contract PDF file through a Flow. Before Spring’18 release, however, it was not possible to attach a PDF file via a Flow. Furthermore, an Admin can also customize Accepted Formats in a Flow to further specify which image file formats a user can upload. However, note that, any files, that are either non-images or are not in the Accepted Formats, cannot be uploaded! This change applies to Lightning Experience and Salesforce iOS app. Also important to note here is that the File Lightning Component works only for Flows that use Lightning runtime. 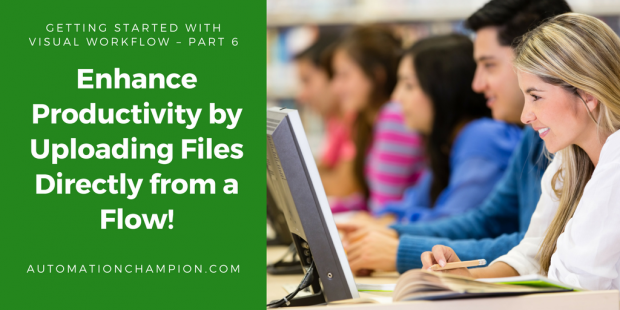 In this article, I am going to show you how one can use File component in a Flow and then make it available to business users. Let us start with a business use case. And, secondly, the Reps must only be able to upload files of type .jpg, .png and .Pdf. –> Remember, to create a Lead we need LastName and the Company information of prospects; for, these are required fields! However, feel free to add more fields if your use case calls for additional fields. The next step is to add a File Upload Lightning component to our flow. Add one more screen element to your flow. For the Lightning Component drop-down on the Field Settings tab, select forceContent:fileUpload. Save the Flow (Type: – Screen Flow) with name Upload File – Test and close the canvas. Now users can attach files to a flow from any device (Salesforce iOS or Android). I hope you can learn from the blog about how to upload files from a Flow!! Yes, go ahead! Show off your newly acquired skills to your friends, colleagues, and families! I can see the component in the page setup. What about the output parameters? Could you give it? I liked this example, however, how do you access the actual file names being referenced or give them unique names when allowing multiple updates. I’m also trying to have a validation to require a file be uploaded which is why I’m trying to get access to the actual file name to test that it’s not NULL. Can you provide some insight here? There is an attribute Upload File Name to get the name of uoploaded file. Okay I got it thanks.